Can you ignore the nearby mega attractions to explore less well known ones? Beyond the image frame to the west is Aristarchus and Schröter's Valley, but here where the sunset terminator highllights small features are some small gems. Start at the bottom left corner with the 4 or 5 rilles running downhill from the Prinz crater area. Do you notice the slightly darker colorations that define this volcanic area compared to the younger and more uniform surrounding lavas? That is a very delicate rise - probably lifting of otherwise buried terrain by a pocket of magma that leaked to the surface to make the rilles. 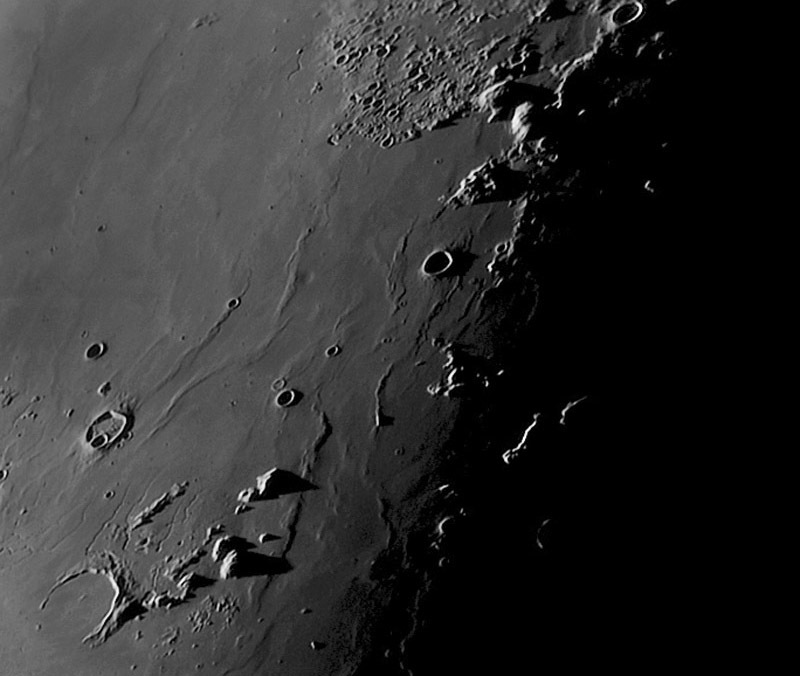 Moving diagonally up the terminator are a series of minor mare ridges that mark broad edges of possible basin rings of Procellarum to the west, and Imbrium to the east. In with these ridges are two craters affected by mare flooding. A little below the middle of the image is a shadow-filled normal crater (Angstrom) and immediately to its left is a crater that looks like a thin Cheerio (an American breakfast cereal). The Cheerio crater probably looked like Angstrom when it formed, but it was created by an impact on an earlier lava flow, and was surrounded by a later flow which also filled it. Further north is a less lucky crater, just right of a mare ridge. This looks like a shallow depression in the mare and it is all that is left of a crater completely covered by lavas - this is an ultra-ghost crater - no ridges mark its rim, just a gentle depression. Finally, up near the top are two massive mounds, the Gruithuisen domes. Based on their spectral signature and morphology they are interpreted to be volcanic, but not mare basalts, rather something more viscous - a kind of lava we didn't sample during Apollo. We need to go back. This page was last modified on 11 February 2019, at 02:03.